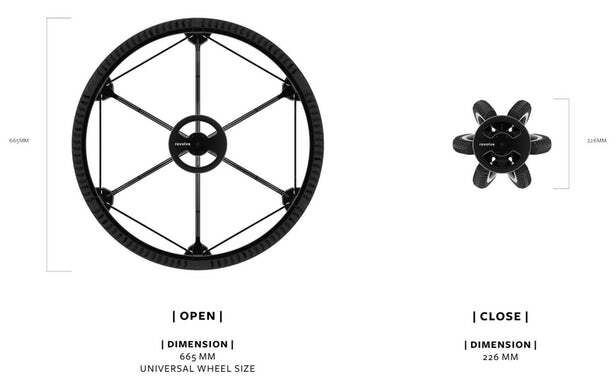 The Revolve is a fullsize 26-inch spoked wheel that can be folded to a third its diameter and 60 percent less space, and back again in an instant, and its commercial availability will offer new design possibilities for folding bicycles, folding wheelchairs and many other vehicles that need to be transported in compact form. 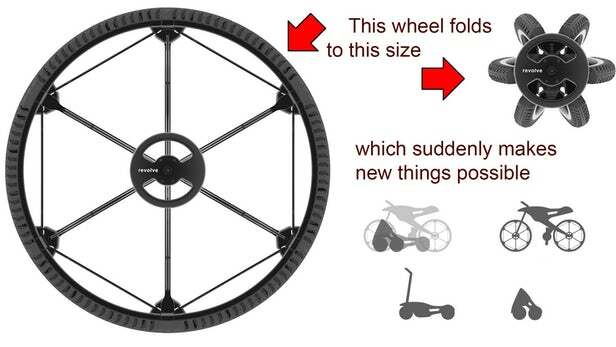 The modular Revolve 26 inch folding wheel was announced this week by German designer Andrea Mocellin, immediately threatening to become a disruptive force in the area of folding mobility. 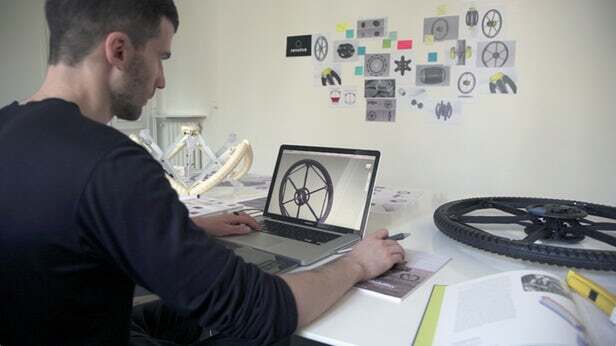 What Mocellin has achieved with his folding wheel has eluded designers since the idea of folding bicycles and wheelchairs was first conceived. The problem which Mocellin's wheel overcomes, is that folding bicycles until now have had to use smaller wheels to be able to fold to a small enough size for carrying, most folding bike manufacturers use 16 or 20 inch wheels. The Revolve can offer full size 26 inch wheels that fold to less than one third their height. "It has been three years of complete immersion in the project," Mocellin told New Atlas. "The patented design was reached after several hundred 3D models and dozens of physical prototypes as I attempted to get the most accurate and efficient folding mechanism." 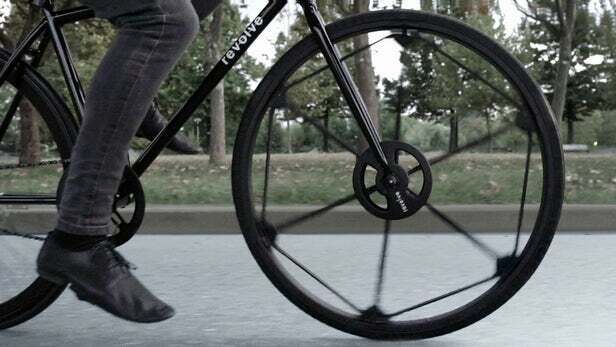 "I didn't design a wheel for single bicycle, but a wheel for many different products that can have the same fullsized bicycle wheel, but can now be folded and reduced in size in many different ways," said Mocellin. "It was conceived as an enabling technology, and when folded, the side wheels that can be added as either traditional wheels or omnidirectional wheels are also designed to enable new ways of making better folding vehicles that can be used and transported in different ways. The aim is to offer the enabling technologies to open new frontiers for the future of foldable vehicles." Andrea has lived in Shanghai, New York and several major European cities, and routinely travels with a folding bicycle, experiencing the airports of the world's great cities, and most importantly, having commuted on the trains, roads, and bike paths of those cities. "The form factor is important"
"I have experienced so many folding bicycles with small wheels that are complicated and ugly when they are closed," said Mocellin. "I wanted to ensure my wheel was beautiful to look at when it was closed. "The people who will use my wheels will store their bicycle inside their apartment, and they do not want ugly folded bicycles to be stored inside their living space. So I worked hard to get a nice form factor ... like an audiophile speaker or a sculpture." "I many times got really annoyed with existing folding bikes because when they are small and light, they invariably have small wheels, and that severely limits what they can do. In an urban environment, there are gutters and steps and cracks in the pavement and obstacles that are a problem for small wheels ... and I also wanted the speed and practicality of a large wheel. "It might still be possible to ride a folding bike with small wheels, but the feel of the bike is the key to whether the customer is happy, and that's the most important thing. "If you want to do sports riding, or off road riding, you need to have larger wheels. If you have large wheels, you can basically have a racing bicycle that can be stored in hand luggage on an airplane. "The airless tires we use are very practical and entirely comfortable in every condition and we are by no means limited in any way in the tire of tread that can be used. It's very easy to use different tread patterns on these wheels that are suited for different surfaces." When we spoke to Andrea Mocellin earlier this week he had just announced his breakthrough product, and the first question we asked was what the immediate future looked like in terms of collaboration and availability of prototype wheels for other manufacturers. "The wheel is patented and it is production-ready, so the immediate aim is now to find investors to take this through to the next stage of manufacturing. "In the beginning, I anticipate that we will sell just the wheel, so that it can be used by other companies in their designs for folding vehicles. "I am entirely independent at this stage and I've spent three years working in secrecy to bring the product to this point ... so my next month is about explaining to the world what is now possible with folding vehicles and we shall see how things evolve from there." "I expect the most important market segment initially will be for wheelchairs. People with disabilities who wish to travel have no choice – they must take their wheelchair with them, and traveling with a wheelchair is very difficult, be it on an aircraft, or in a car, on the underground, anywhere. "Helping people with disabilities to have an easier life is one of the key goals of the project, and I expect that once the inventors of the world have seen the components I have developed, there will be some ingenious solutions developed in short order." 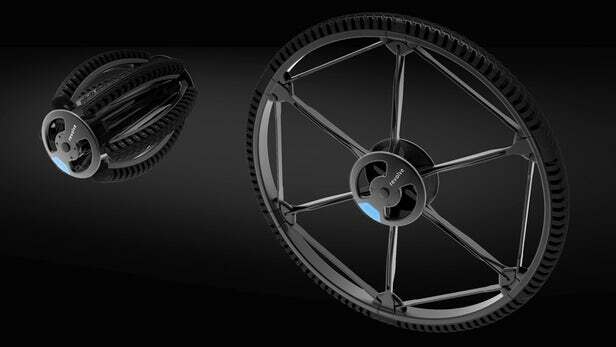 "At the same time, I want to develop the foldable bicycle to the next stage. At first, my goal was to develop the wheel to the point where it worked perfectly, and now I have a final prototype that works, my next stage is to develop the folding bicycle to work just as well as the wheel." So what's the big plan? "Quite clearly there are many different ways in which the folding wheel can be used, and folding bicycles and folding wheelchairs are just the low hanging fruit. Wheeled drones that need to be transported in a compact state are another marketplace with great potential and ... now that wheels can be folded, people will find uses for them. "I think the primary aim, in the broadest sense, is for Revolve's wheels to become a signature product for global travelers. To see our distinctive form factor used on the highest quality travel products."